But wait, there are printing and copying costs. Monochrome ink for an ink jet printer will cost between 4 and 10 cents per sheet (assuming an average coverage of 20%). Color ink for an ink jet printer will cost between 9 and 26 cents per sheet. Laser toner, both color and black, cost slightly less than their ink jet counterparts. Typical photocopy costs average 3 cents per page after factoring in the expenses of toner, hardware, electricity, repair, etc. As you can see, just preparing printed materials for teachers and students could minimally double the paper cost per person, and realistically raise this cost 10 to 50 times depending on the print quality and page coverage. Keep in mind that this does not account for the shipping, storage, filing, and clean up costs associated with this paper use. 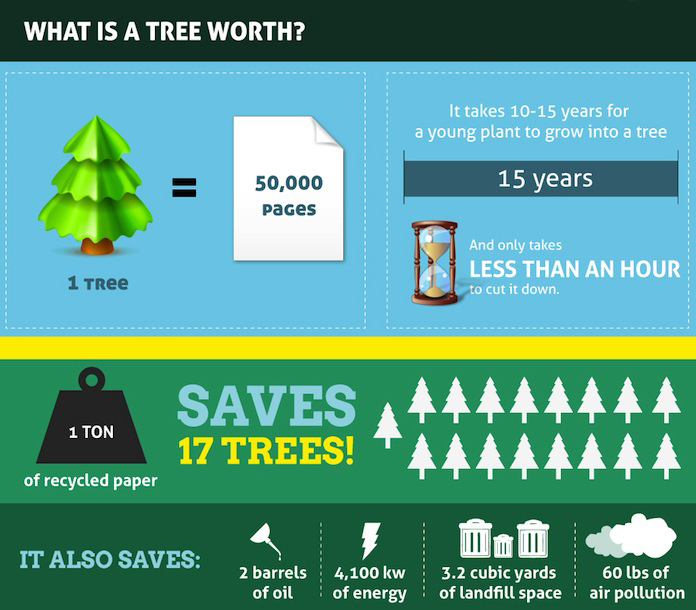 It also does not account for all of the other forms of paper that we use daily in our offices, schools, and homes. My school district, like many large organizations, could save between $500,000 to $1,000,000 or more, per year by adopting paperless practices. For additional detail on paper & printing costs - check out the following video (Going Paperless in Classrooms - Douglas County School District) and additional web resources. 50%of the world's forests have already been cleared or burned, and 80% of what's left has been seriously impacted by wood harvesting for paper. Municipal landfills account for one-third of human-related methane emissions (and methane is 23-times more potent a greenhouse gas than is carbon dioxide). Compared to using virgin wood, paper made with 100% recycled content uses 44% less energy, produces 38% less greenhouse gas emissions, 41% less particulate emissions, 50% less waste water, 49% less solid waste, and of course, 100% less wood. 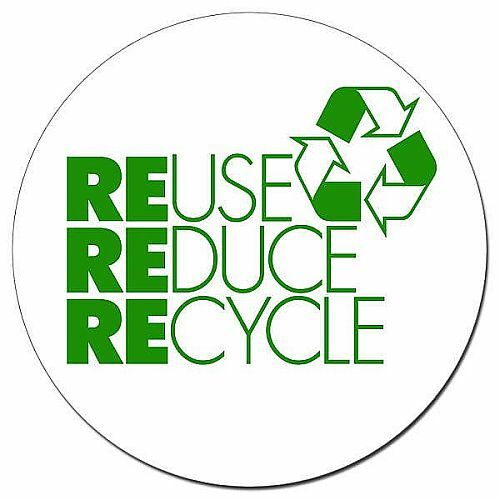 Printing and writing papers use the least amount of recycled content -- just 6%. Tissues use the most, at 45%, and newsprint is not far behind, at 32%. Reducing or eliminating printed paper in schools and offices would significantly impact our environment in many positive ways. Information that has traditionally been recorded, stored, and shared on paper is quickly being replaced by digital transmissions and services. The world wide web allows countless users to share and interact with information simultaneously. Transactions that would take days to complete, can now transpire in seconds. Reading digital material offers significant enhancements to improve engagement and interaction. Online assessment offers opportunities for differentiated instruction and instant feedback. Digital communication allows us to connect, learn, and interact with other learners. Like many people, I appreciate the value of time. Becoming more digitally literate in our daily lives not only preserves costly, renewable resources, it also helps us to use our most precious non-renewable resource, TIME, in more efficient and effective ways. Amusing French Video - "Not completely paperless"
"Tips & Resources for a Paperless Classroom"
Will School Printers Become a Thing of the Past? Finally, there are a lot of ways to save trees, barrels of oil, energy, landfill space, and reduce air pollution, and one of the solutions is to adopt paperless practices. Excellent ideas you have here! Keep them coming! Unfortunately no one is going to give up printing on their own. Some type of policy or set of guidelines need to be put into place to reduce the amount of printing that occurs in your school. Introducing a cap on printing will be PAINFUL and teachers are going to HATE YOU but there's no easy, gentle way to make it happen. Good luck!